There’s not much remaining in the old mining town of Clifton, located near the Central Nevada mining town of Austin. But, for a time, Clifton was a genuine rival to its better known sister city. Rich reserves of silver ore were found in the Pony Canyon area of Central Nevada in May 1862. By mid-1863, a tent city of about 500 miners, which was named Clifton, had cropped up near the mouth of the canyon. Within a year, Clifton had its own post office, hotels, restaurants, an assay office, saloons, shops, a Wells Fargo office and other businesses. Clifton’s property owners were so certain of their town’s future that the price of lots soon skyrocketed. Not surprisingly, another town soon appeared farther up the canyon, which was named Austin. To entice people to locate in the newer community, Austin lots were offered free to businesses in exchange for help in developing a graded road from the Reese River Valley to Austin. So, despite the fact that Clifton had the advantage of being situated in a flat area while Austin was in a steep canyon where it was more difficult to build, the latter soon eclipsed Clifton. Completion of the road—which bypassed Clifton—marked the end of the town. While Clifton still had more people than Austin in May 1863, by the fall, Austin had enough political power and population to claim the Lander county seat. Within months, most of Clifton's residents had moved to Austin or other mining camps. Reports describe an empty main street lined with abandoned wooden shacks and stores. The post office closed in February 1864 (although it reopened briefly in 1867-68). The former site of Clifton experienced a brief revival in 1880 when it became the location of a terminus for the Nevada Central Railway and the Austin City Railway (which carried the quaint name "Mules Relief"). A large 30-car train siding was constructed and the former town site, now called Austin Junction, housed a small engine house, turntable and depot. Despite the railroad activity, no houses or businesses were built in the area. In 1894, the Austin Mining Company, owned by J. Phelps Stokes, constructed a 40-stamp mill at the mouth of 6,000-foot Austin-Manhattan Tunnel, just above the former site of Clifton. The Clifton Mill operated for about ten years. Today, Clifton offers a handful of ruins and plenty of memories. The large worn, wooden shell of the 100-year-old Clifton Mill remains standing (but remember, it is on private property and is extremely unsafe—so don't enter the building or touch anything). Adjacent to the wooden structure are the massive stone walls and foundations of other buildings once part of the mill. Wandering the grounds, you can also find rusted metal scraps, machine parts and other mining garbage. A huge tailing pile spreads out in front of the mill building. A turn-of-the-century photo of Clifton that appears in Stanley Paher’s excellent book, “Nevada Ghost Towns and Mining Camps,” shows an extensive complex that includes an elevated ore cart track. The flat area below the mill—part of the former Clifton town site—was later used as a baseball diamond and for other sports. More recently, a rodeo arena was erected on the site. On the hillside near Clifton, you can see Austin’s historic cemetery, which contains gravesites that date to the 1860s. Overlooking Clifton is Stokes Castle, a three-story stone tower built in 1896-97 by the Stokes family. The building, designed to resemble a roman villa, was only used briefly as a residence. According to local legend, the owners, who controlled nearly all of Austin’s mines, could also stand on the tower balconies and spy on workers, who they thought might be stealing ore from the mines that surrounded the building. The tower was abandoned in late 1897 and has deteriorated considerably over the years. The outside balconies as well as the interior stairs and floors collapsed many years ago. Today, the tower’s stone shell remains an interesting local architectural historical landmark. The site of Clifton is located three-quarters of a mile west of Austin via a dirt road. To reach it, turn south of U.S. 50, just past the Austin cemetery. You can find more information on this one time rival to Austin in Paher’s “Nevada Ghost Towns and Mining Camps” and in “Romancing Nevada’s Past, Ghost Towns and Historic Sites of Eureka, Lander and White Pine Counties,” by Shawn Hall. While not much goes on in Star City today, for a short time it was one of the largest communities in North-Central Nevada. Star City—or rather the site of the mining town—is located in Star Canyon, one of several scenic ravines found on the east-side of the Humboldt Range. While little has been written about Star City, historical records indicate that significant silver deposits were discovered there in about 1861. Within a relatively short period of time a small community was established around the mines and by 1862 a post office had opened. Star City’s growth was remarkably rapid. In 1863, the town had swelled to an estimated 1,200 residents and, according to Nevada historian Stanley Paher, the town was the largest in Humboldt County. Additionally, according to Paher, within two years of the town’s founding it had gained a couple of hotels, several saloons and stores, a school, a telegraph office and a Wells Fargo branch. Star City’s most successful years were between 1864 and 1865, when seven mining companies operated in the canyon and one mine, the Queen of Sheba, produced an estimated $5 million between 1862 and 1868. For a time, the Sheba Mining Company also operated a ten-stamp mill, open 24-hours a day, to crush and process the ore.
Paher notes that during this time, Star City was even home of a literary society known as the Gander Club. Unfortunately, the Sheba Mine quickly ran out of ore (by 1868) and the population soon moved on to more productive places. The 1870 census reported only 78 residents in the town (an amazing population decrease of nearly 1600 percent in about three years!). The town’s post office closed in September 1868. No one has lived in Star City for more than a century. While apparently there has been some sporadic mining activity in Star City, it has largely remained a nearly forgotten, old Nevada mining town. The former site of Star City can be reached by driving east of Reno on Interstate 80 to the Mill City exit (about 45 miles east of Lovelock). Head south on State Route 400 for about 10 miles, then turn left onto a dirt road that leads to the site (there is an historic marker there), which is five miles west. 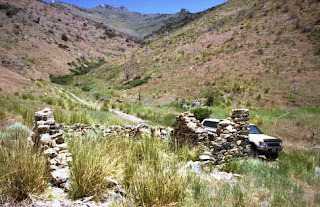 The four-wheel drive road crosses a stretch of sage-covered desert before it begins to climb into the mouth of the canyon, parallel to a small stream (Star Creek). The town site is located in a wide spot where the road more or less ends (it’s wide enough to turn around). To the immediate west is one of the area’s most picturesque spots, where you’ll see the rocky cliffs of Star Canyon and the wooden head-frame of the Queen of Sheba Mine. Not much remains of Star City except for about three or four rock foundations and crumbling stone walls, which can be seen scattered about the hillside, peeking out of the sagebrush and tall grass. Adjacent to the town’s ruins is Star Creek, a pleasant brook lined by lush vegetation and a handful of poplar trees that flows out of the mountains. As you wander closer to the Queen of Sheba head-frame, you’ll find the site of the old mill (only a few rock foundations remain) as well as an abandoned but wide, open mine shaft (it’s not very deep, looking as if it had caved in some time ago). After you’re done exploring Star City, you can head back to State Route 400 and it’s only a short 10-mile drive south to Unionville. 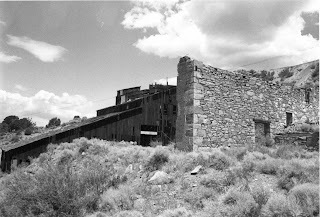 There, you’ll find the ruins of another former mining town, where Mark Twain spent some time, as well as a classy bed and breakfast known as the Old Pioneer Garden Country Inn (for information, call 775-538-7585). One of the most fascinating figures in Western history was the Paiute religious leader, Wovoka, who was born near Yerington in 1856. Wovoka was raised by a white family, the Wilsons, from whom he took his white name, Jack Wilson. While living with the Wilsons, who had three sons, Wovoka was exposed to Christian beliefs. Abigail Wilson often read Old Testament stories to the children. In 1887, Wovoka, whose name is Paiute for “woodcutter,” was chopping trees in the Pine Nut Mountains when he reportedly had a heavenly encounter. According to his later testimonials, he heard a loud noise, began to investigate and was struck down. As he lay on the ground paralyzed, he had an out-of-body experience during which he was taken to heaven. Wovoka said that God told him to instruct the Indian people to be good to others, to cease hostilities with whites, and not to steal. He also told Wovoka to preach the new religion and teach the people the Ghost Dance. In return for embracing this new religion, its practitioners would be reunited with loved ones who had died, would remain young forever, and would be free of death or sickness. By 1890, Wovoka’s Ghost Dance religion had begun to gain national attention among Indians. On several occasions, Wovoka had gone into trances, during which he would be as rigid as a board, for conversations with God. Additionally, Wovoka performed several shaman tricks—his father had been a medicine man—designed to enhance his standing as a man of magic. Unfortunately, as historical writer Don Lynch has noted, one of his tricks, during which Wovoka appeared to be unhurt after being blasted by a shotgun, gave many followers the impression that if they did the Ghost Dance they could not be killed by bullets. Wovoka’s teachings, which were essentially peaceful, spread across the country and appealed, in particular, to members of the Plains tribes, who had suffered greatly as a result of the confiscation of their lands. Unfortunately, the Ghost Dance concept began to evolve as it moved east and its followers performed the ritual with increasing fervor. The religion was energetically embraced by the Sioux people, who added the ghost shirt, a painted cloth shirt that was believed to make its wearer bullet-proof. Some whites who witnessed the frenzied dancing believed it was some type of prelude to war and would lead to an Indian uprising. The rising tensions finally resulted in the tragic massacre at Wounded Knee—during which nearly 300 Indian men, women, and children were killed by U.S. Army soldiers. Among the casualties was the great chief, Sitting Bull. Wounded Knee effectively ended the national Ghost Dance movement. After hearing of the massacre, Wovoka told his followers to go home and cease dancing. Yet despite the unfortunate consequences of the dance, Wovoka remained an important religious figure in Western Nevada. For the rest of his life, he continued to preach the message of brotherhood and peace. He died in 1932. Today, it’s still possible to wander the wooded banks of the Walker River near Yerington, where Wovoka grew up, and imagine the young Wovoka tossing rocks into the water. 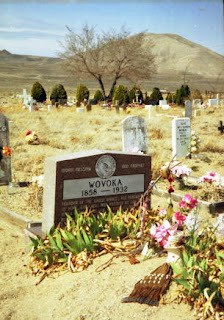 Wovoka is buried in the cemetery at Schurz, located 24 miles east of Yerington. An impressive headstone (which incorrectly notes the year of his birth) points out his role as the “Indian Messiah” and founder of the Ghost Dance. A good source of information about Wovoka is “Wovoka and the Ghost Dance” by Michael Hittman, which was published in 1990. Few places in the West are as picturesque or historic as the town of Lamoille, which sits at the base of the Ruby Mountains, about 20 miles southeast of Elko. The first residents of the Lamoille area were Shoshone, who lived in seasonal villages in lower Lamoille (near the site of modern day Halleck). In 1865, John P. Wallace and Thomas A. Waterman, two miners from Austin, settled in the upper Lamoille Valley, near the Rubies. The two erected a crude log cabin, which they shared, and planted grain to sell to travelers heading to California. Waterman is believed to be responsible for naming Lamoille. A native of Johnson in Lamoille County, Vermont, Waterman is said to have named the valley because it reminded him of his home in Vermont. The word, Lamoille, is an anglicized version of the French word, La Moitte, which means gull or mew, a type of bird usually found at the mouth of a river. By the late 1860s, the Lamoille Valley had several dozen small farms. A school was established in the early 1870s—the old Walker-Waterman cabin served as the first schoolhouse. A more formal school was finally constructed a few years later. Historian and longtime Lamoille resident Edna Patterson, who lived there from 1927 to 1973, noted in an article in the Northeastern Nevada Quarterly that the first church service in Lamoille Valley was a Presbyterian service conducted in the school house in 1872. In 1905, the Presbyterian congregation was responsible for constructing what must be considered Lamoille’s most recognizable landmark, the picturesque Lamoille Presbyterian Church. The impressive, high-steepled, whitewashed church, which originally cost $3,000, remains in use. Patterson points out that while Lamoille was intially a grain-producing area, farmers soon branched into cattle and other agricultural products in order to meet the food demands of mining camps in the region. The town of Lamoille traces its roots to John Walker, who built the Cottonwood Hotel in Lamoille in 1869. The hotel included not only rooms but a blacksmith shop and a saloon. Walker erected his complex at a place called Lamoille Crossroads, a spot on one of the routes of the Humboldt Trail, which many pioneers traveled to reach California and Oregon. Within a few years, other businesses cropped up near Walker’s hotel including the Lamoille Merchantile Co., which in addition to housing a store had a hotel and dance hall. The owners of the Merchantile also erected a series of tent frames in a thick stand of cottonwood trees at the crossroads and set aside the grove of trees as a recreational area. 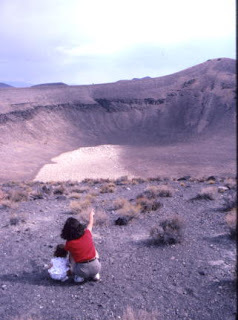 The tents were rented on a weekly basis to vacationers from Elko, making it one of the area’s first tourist-related services. In the early 20th century, Lamoille gained a flour mill and a creamery, which for many years produced butter and ice cream. Additionally, in 1912 the Elko-Lamoille Power Company was formed and a year later installed a small hydro-electric generating plant on the stream that flowed out of Lamoille Canyon. 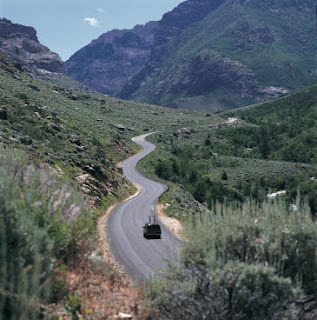 The road into Lamoille Canyon, which today is an official scenic byway and one of the loveliest drives in the state, was constructed in the early 1930s by the Civilian Conservation Corps, a federal work program that during the Great Depression employed youths from economically-depressed parts of the country. In more recent years, the area between Elko and Lamoille has experienced tremendous growth. But, Patterson, notes, Lamoille remains a very special place. “The Lamoille area, gateway to the Ruby Mountains, has been a garden since the lands of Nevada were opened for settlement ,” she writes. “Here people lead and enjoy free and uninhabited lives. The sun shines bright and clear, unfogged by city smoke. While the new Truckee River Whitewater Park in downtown Reno has garnered considerable attention in the past year, there’s another spot on the Truckee that long has been popular for a more leisurely brand of river rafting. The stretch of the Truckee River between Tahoe City and River Ranch has offered quality, river floating for many years. In fact, two companies, Truckee River Rafting/Mountain Air Sports and Truckee River Raft Company, lease all the stuff you need for a trip on the river. Both operate from Tahoe City and offer self-guided floating excursions that include a large, commercial raft, paddles, life jackets and a shuttle ride back to the launch point. That doesn’t mean, however, that floaters are required to rent from the two companies. Anyone with a flotation device (inflatable mattresses, pool furniture, inner-tubes, etc) can jump into the river (go downriver from the launching points of the two commercial companies) and begin the three-hour, five-mile journey. Of course, if you’re doing it on your own, make sure you’ve made arrangements to get back to your vehicle when the ride is over. Most folks bring two cars; one to reach the launch point and another to leave where they exit the river. And anyone deciding to take the ride should make sure they’ve brought water (or other liquid refreshments), sunscreen and perhaps some kind of water shoes or sandals. As for the actual rafting ride, this portion of the Truckee is amazingly peaceful, lovely to view and leisurely. While there are a handful of good rapids along the way, the trip is generally pretty tame by most river rafting standards. Departing from Tahoe City, just below the Lake Tahoe spillway, the river floats past something that locals call “bubblegum bridge” and begins a meandering course through the tall pines. At several spots along the way, rafters frequently pull to the side to do a little swimming or splashing around in the pools that have formed. Along the way, the river intersects beautiful meadows filled with colorful wildflowers. Laying on the raft, enjoying the bright sun overhead, the rich, blue sky, the gentle rocking of the water, sometimes it’s hard not to want to take a nap. Be aware, however, that the river is popular, particularly on weekends, so much of the time your boat is likely to be surrounded by other floaters, some of whom will be challenging each other (and you) to a water fight. Some of these combatants pack water pistols. Additionally, the river rushes around lots of large rocks and boulders so be prepared to use your paddle to maneuver the raft around these obstacles. The latter part of the trip encounters several rapids that are the highlight of the float. It’s common to suddenly find your raft heading straight into a large boulder and then bouncing backward or sideways (so hang on tight). This stretch is also where some have their rafts become stuck (or high-centered) on a rock and struggle to get free. A bit farther and around a curve is River Ranch, a restaurant and resort on Alpine Meadows Road, which serves as the exit point. Here, rafters frequently enjoy lunch or refreshments before returning to their cars. 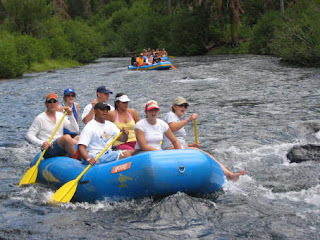 For reservations (recommended for weekends and holidays) or more information on using the services of one of the commercial rafting businesses check out: Truckee River Rafting/Mountain Air Sports, 888-584-RAFT or www.truckeeriverrafting.com or Truckee River Raft Company, 530-583-0123, www.truckeeriverraft.com.